Ruby the VW Campervan is parked on the very lovely Deepdale Backpackers hostel and Campsite, at Burnham Deepdale, North Norfolk. We’ve driven by this place many a time, but the recent addition of electric hook ups and a complete toilet and shower revamp saw us booking on back in September for our much anticipated New Year break. The campsite is absolutely excellent by the way; huge pitches and probably the best facilities we’ve ever come across; plenty of massive wet room showers with your own private loo and hand basin, even heated flooring! There are plenty of dish washing facilities, free Wi-fi and even not one, but two warm doggie showers! These are the facilities just on site, aside from these we’ve got a fully stocked supermarket/petrol station that is open 7-7 even on New Year’s Day! A number of lovely shops, a cafe, not one but two pub/restaurants, the Norfolk Norfolk coastal path running practically from the site and a bus stop that is the coastlines and runs from Hunstanton to Fakenham and back every hour. It’s just the perfect place to spend New Year- a time when we always end up walking miles and miles to try and burn off some of those excess pounds that we’ve gained since, well Texas really! The journey here on Sunday was indirect from ours but relatively quick- just over an hour and we were pulling onto our pitch. We took our time setting up as our last pack away was in the middle of the night and after a hearty lunch of homemade pea, ham and mint soup, made in my compact soup maker that Santa brought me, we donned our boots and set off on a small walk. The soup was amazing by the way! We turned left out of the campsite and walked along the coast path towards Brancaster Staithe, a walk of around 1.5 miles and then looped back along the road, obviously checking the two pubs out too. We passed two small places selling fresh mussels. Obviously we brought a bag of live mussels, (and some fresh eggs) ready for a starter tonight. Sunday night was spent chilling before dinner. Dinner was a rather exciting affair; first we had the local Brancaster mussels, cooked in a simple white wine and onion sauce- oh my they were good. Main course was homemade turkey, ham and leek pies using our new gadget, an electric pie maker. I made the pies at home and we reheated them in about 15 mins using electric. It was a blustery wet evening, and our pie and mash dinner really hit the spot! It never fails to surprise me how well we eat in Ruby, considering we only have just two gas hob rings! We had a fairly lazy morning, and after a breakfast of sausage and egg baps, we set off on a 3 mile or so saunter, this time in the opposite direction of yesterday’s walk – so turning right out of the campsite. Despite leaving Ruby at 11:30 we found our pace was fast, so we decided to pause for a quick drink at The Hero, and then carry on along the coast path through Holkham and finishing at Wells-next-the-Sea 11 miles later! The final approach to Wells Next the Sea. Boy those fish and chips were calling us! We arrived at Wells at 3pm, not bad at all- we really loved the walk, even with our fast pace! Obviously after such a long walk with no snacks/water (although there is a cafe with water station and loos at Holkham. And a pub which we didn’t stop at!) our first objective was to find a drink, and then fish and chips at Frenchies which hit the spot and beyond, before grabbing the next coasthopper bus back to the campsite (£2.10pp & £1 for dogs). We accidentally 😜 missed our stop and got off at the next stop, the Jolly Sailors, for “one for the road”; well it was NYE! Our evening was quiet and chilled, exactly as we like it. We managed to polish off a steak and noodle dinner around 9.30pm, and then opened a bottle of fizz as we waited for the big countdown. The atmosphere on site was good – a lot of campers had gone down to the Jolly sailors (or we assume they did as we watched them leave dressed as pirates and there was a pirate party on). A midnight, a few of our neighbours came out with sparklers singing Auld Lang Syne, and in the distance (but far enough not to trouble Jazz) we watched a pretty impressive firework display. But ten mins later the site was quiet again, so we pulled out the bed and promptly dozed off – not waking again until 10am. New Years Day started rather lazily, in fact, I don’t think I got out of bed until 11! Once I did get up I made us a fry up, and we tested our legs after yesterday’s long walk. Luckily neither of us had still legs so we decided to do a nice 4.5 miles loop provided by the campsite, Burnham Deepdale – Brancaster and back via Barrow Common. Despite there being a few drops of rain as we lay in bed, by midday the weather had cleared right up, and actually the sun was attempting to show its face. We really enjoyed walking over Barrow common, and took the opportunity to toast the new year with a swig or five from our hip flasks whilst looking out to sea. There is an interesting time team episode filmed here which we watched later on. The walk rejoined the coastal path just below the fort and we followed it all the way back to Burnham Deepdale. As we passed Brancaster Staithe the sun fully came out and the light was just wonderful. The tide was now almost fully in and lots of people were out taking pictures, bird watching, even some launched sea kayaks. It really is my happy place here. A mile or so further along and we returned to our starting point, and paid a quick stop at the church to see the Norman square font, before returning to the campsite, just in time to watch the sun dip down behind Ruby. The first sunset of 2019. All this walking means we are hungry Horace’s, so we devoured a cheese board for a late lunch and then a delicious slow cooker venison and red cabbage stew for dinner. Recipe below, it was gorgeous! We’ve had a brilliant break, and really feel recharged and ready to start the year with a bang. We’ve signed up for Country Walking’s Walk 1000 miles in 2019, (we actually started it on 27th Dec hopefully that won’t matter) so are going into 2019 with lots of walking based trips in mind, and lots of trips in Ruby and beyond already booked. 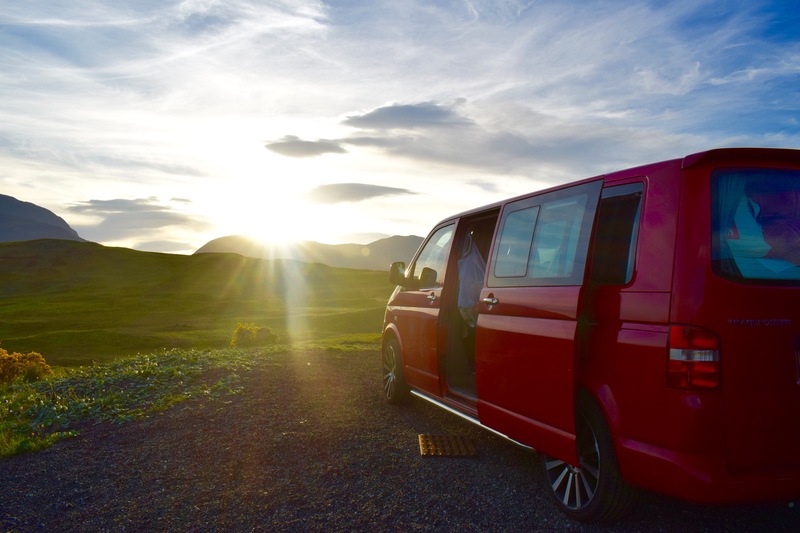 Whatever 2019 brings for you, I do hope it’s a good one, and if you have a camper van, Motorhome or tent, we really really recommend a visit to Deepdale Farm. We’ll be back for sure! Is it me, or has this half term just flown by?! It only seems like last week that we were returning from China, but in fact we’ve been home for 6 weeks now and therefore it’s surely time for another road trip. 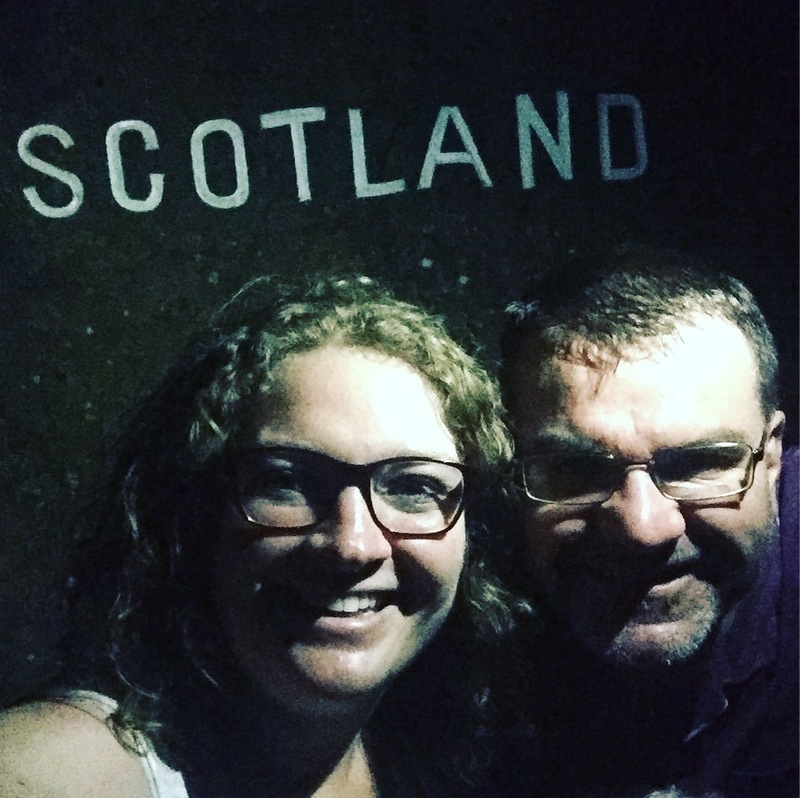 May Half Term for the last few years has been earmarked as our annual jaunt up to our most favourite travel location of them all, Bonny Scotland. Thursday is our mad busy day at work and we don’t finish in Thetford until 7pm. 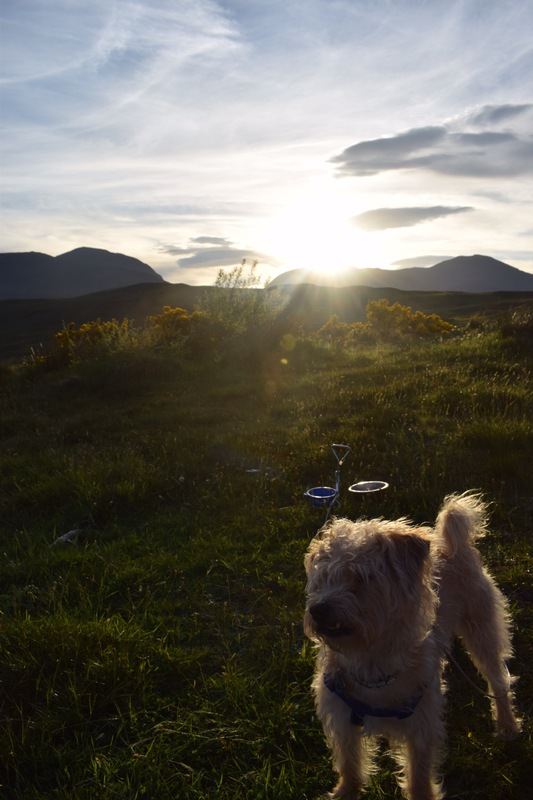 We parked a fully loaded Ruby the Campervan at school, then Mum delivered Jazz the pampered pooch to the school gates at 7pm, and by 7.10pm we were on A14 heading towards Carter Bar border crossing near to Jedburgh. Friday dawned disappointedly cloudy, but this enabled us to make a very quick exit from Carter Bar as we weren’t distracted by the view. We shared our space with a traditional romany gypsy cart and horse, but for the first time ever, no other motorhomes. 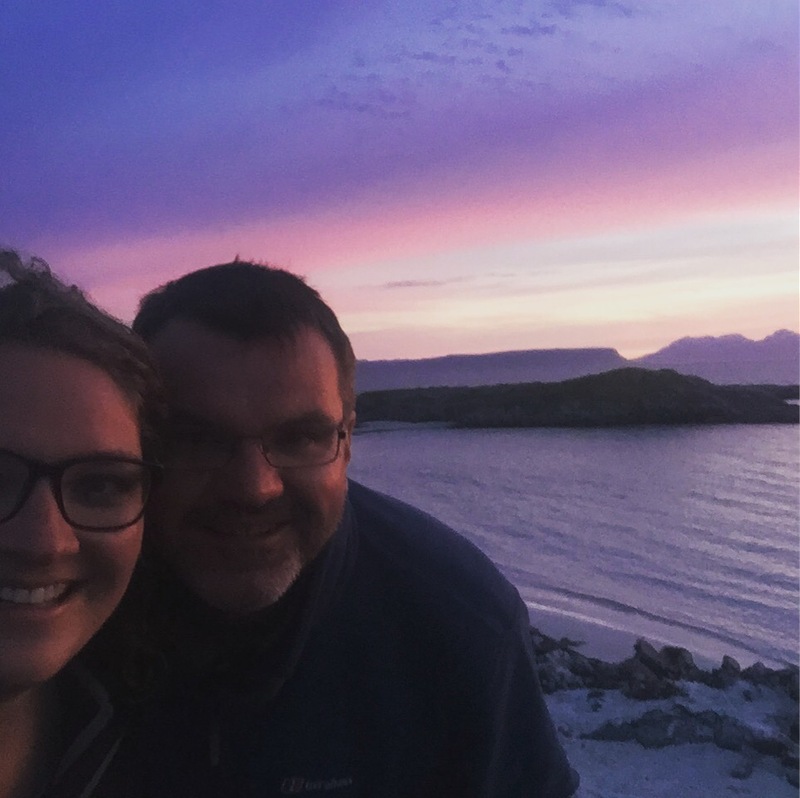 We had quite a drive today as we were skipping through our normal stopovers of Loch Lomond and Black Mount in order to get to Silversands Arisaig in one day. 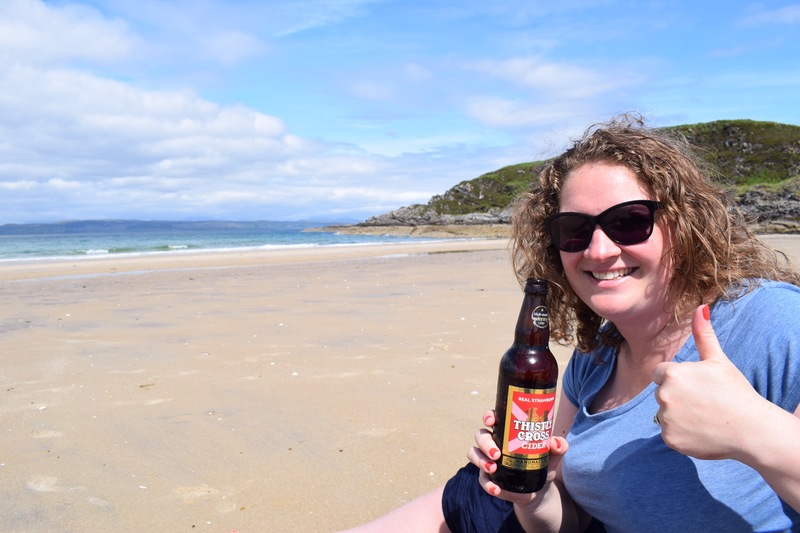 We did however make exception for the Loch Lomond Farm shop, a traditional stop for us to line Ruby’s fridge full of local fresh meat and ale and cider. 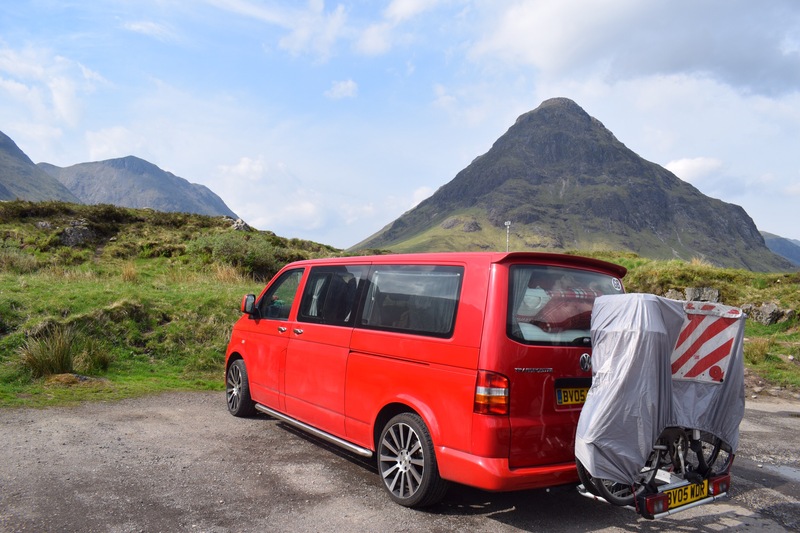 We had a quick picnic “on the Bonny Bonny banks of Loch Lomond…..” before carrying on the A82 up past the Bridge of Orchy, Black Mountain, Glencoe and then Fort William. We were noticing that the traffic was a lot heavier than other years, in fact we were nearly unable to get parked at the Glencoe viewpoint, definitely no cuppa this time, so instead we stopped at the Glenfinnan monument for a cuppa and a quick leg strech before arriving at Arisaig Silversands campsite at 5pm. We’ve been to this site several times previously. 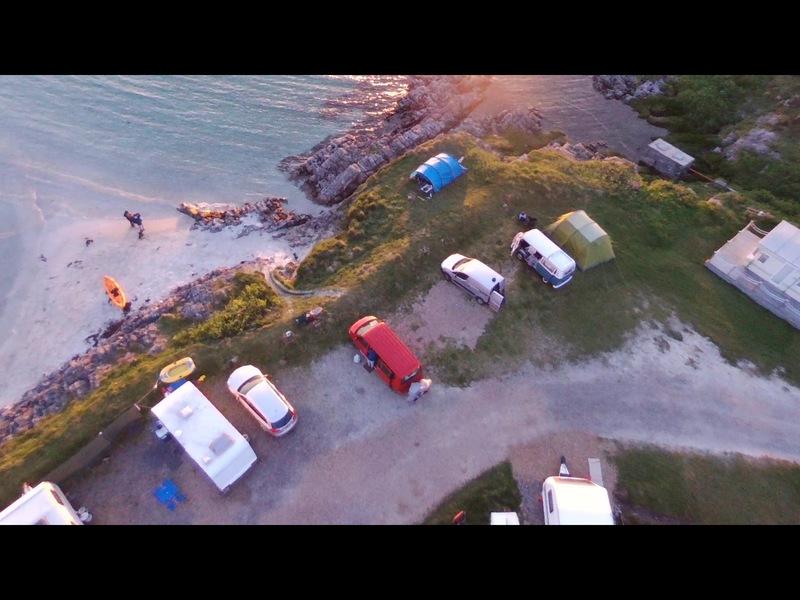 In our opinion, its one of the best beachside campsites in the UK. Especially if you book early and manage to get one of the beach front pitches. The showers and loos are basic but clean. And just look at our view! 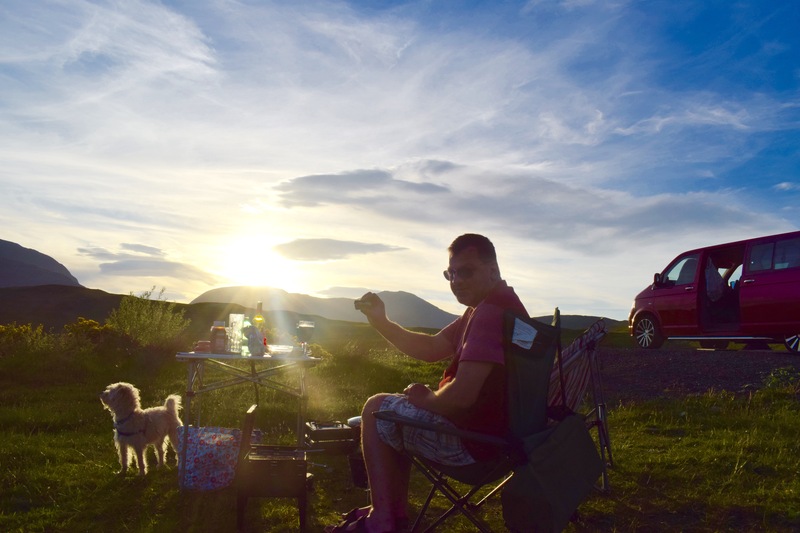 We got the gas grill out and set about cooking a burger feast from our farm shop haul for dinner before enjoying a sensational sunset and a wee dram. We couldn’t believe when we looked at the clock, expecting it to be near to 9pm – it was actually nearly 11pm and still pretty light. The weather was just glorious! 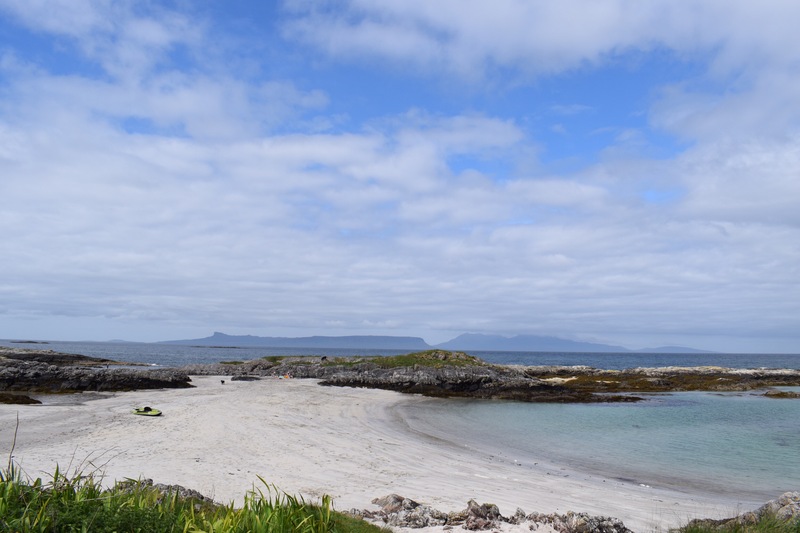 Our plan was to unload the bikes and cycle round to nearby Camusdarach Beach which is where Local Hero was filmed, just like we did last year. However, the weather was just so gorgeous, and the beach in front of Ruby looked so inviting, we decided that we would stay at the campsite all day and enjoy the campsite beach and have a chill. Out came the self inflating sofas and we made the long (10 metre) walk to the beach which is where we stayed ALL DAY! We’ve never ever done this on a camping trip – we always try and cram in some cycling or walking or exploring. Jazz loved it as because the beach was empty he got to do lots of off leading which we normally can’t do as he’s not the most obedient pup in the world! 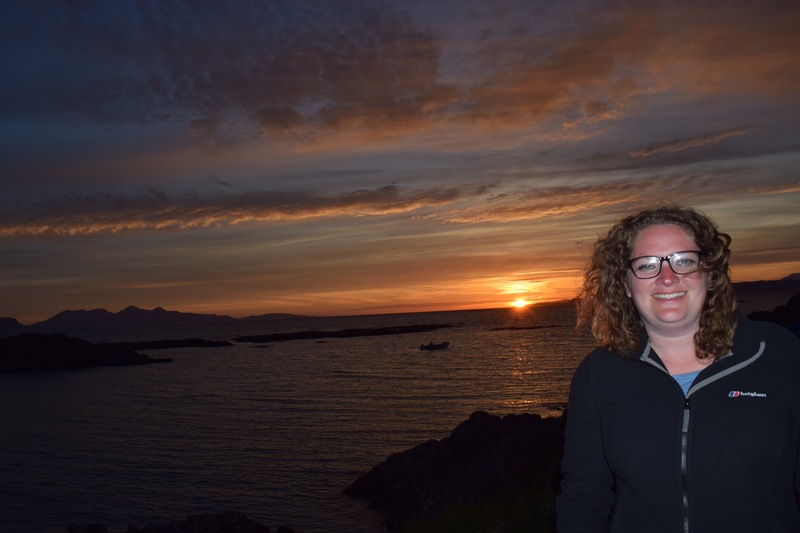 We actually managed to get sunburn – this is a first for us in Scotland. We felt like we were in Greece on a beach holiday. It was perfect. A perfect day has to end in a perfect BBQ, and Keefy did not let us down on this. After another incredible sunset we hit the sack. A lovely relaxing day. 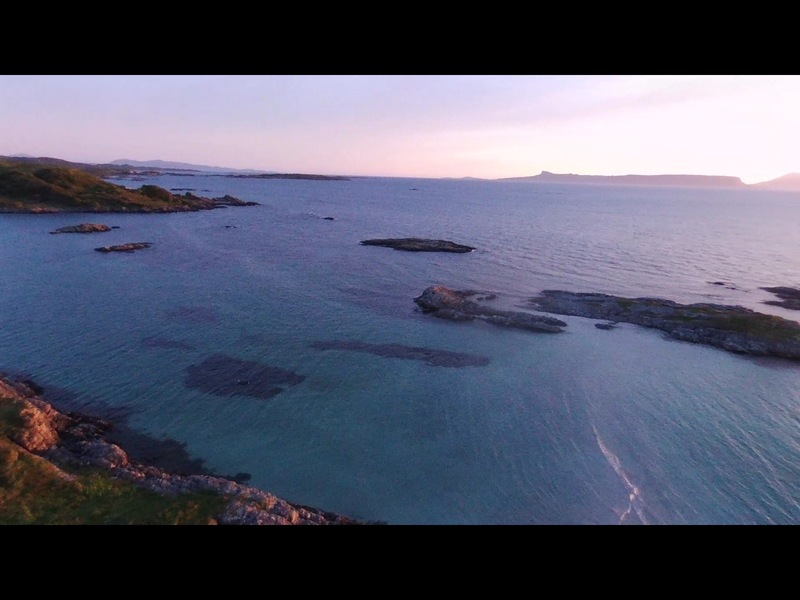 We had a relatively early start today as it was time to wave goodbye to our stay at SilverSands. 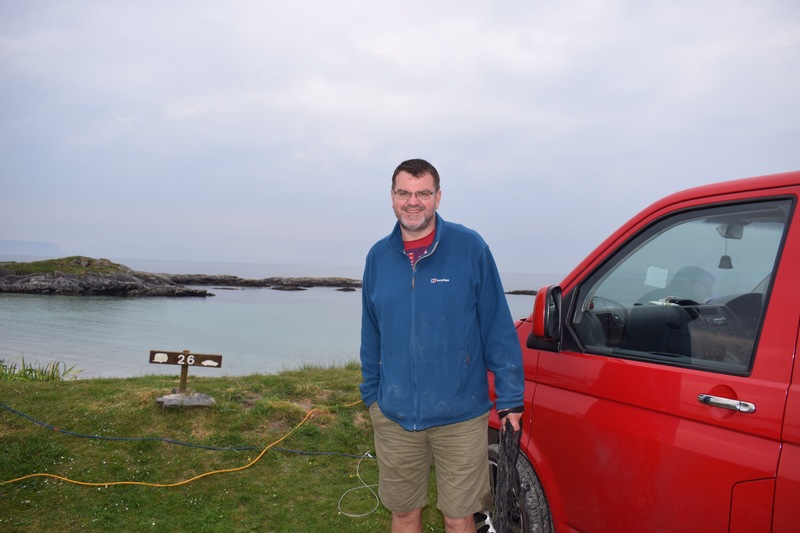 We waved a sad goodbye to owner Jim, around 9am and drove the short distance on the coast road to Camusdarach Sands. 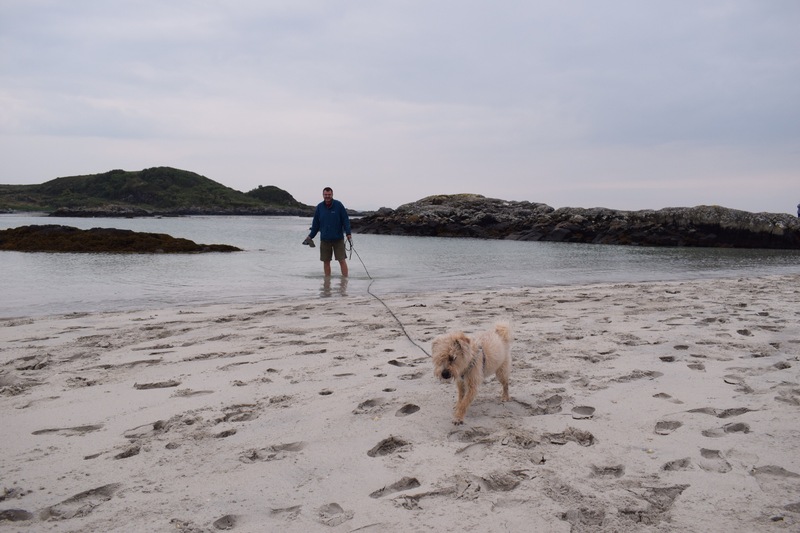 As the beach was quiet I had a play with my drone and Keith pretended he was Peter Reigert (Mac in Local Hero) and went for a long walk along the shoreline. The weather was just beautiful again. 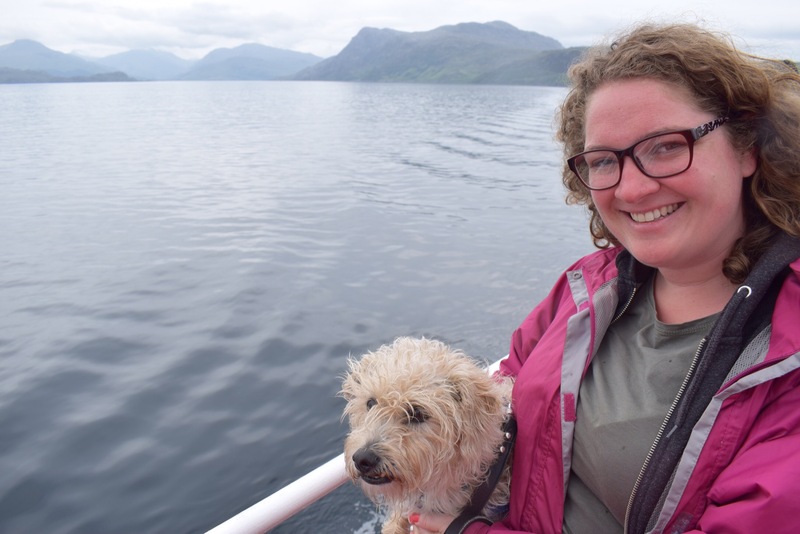 Around 10am, we set off to Mallaig, and after stocking up on some supplies at the Coop we boarded our first of two ferries that day – Mallaig to Armadale (Skye). The journey was smooth and enjoyable, we had the binoculars out looking for wildlife. We were first off the ferry which was handy as we had to drive across Skye from Armadale to Uigg for our next ferry to the Isle of Harris. 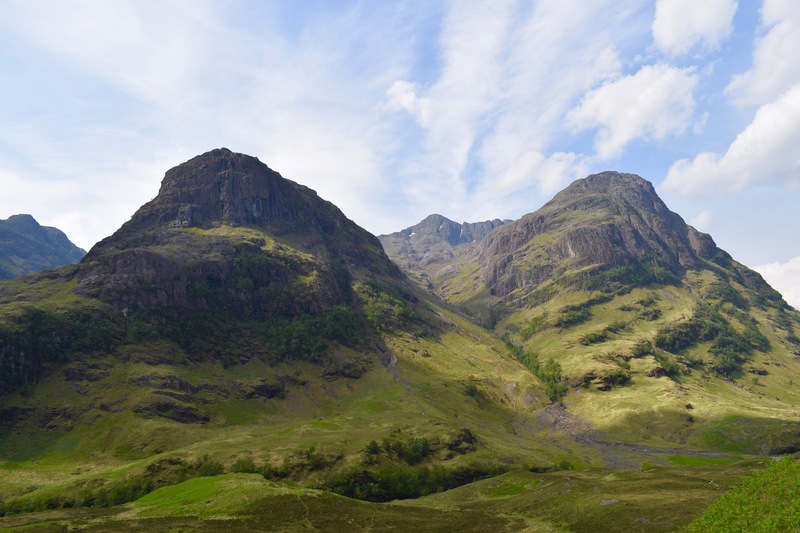 Skye was looking wonderfully green against the bright blue sky. 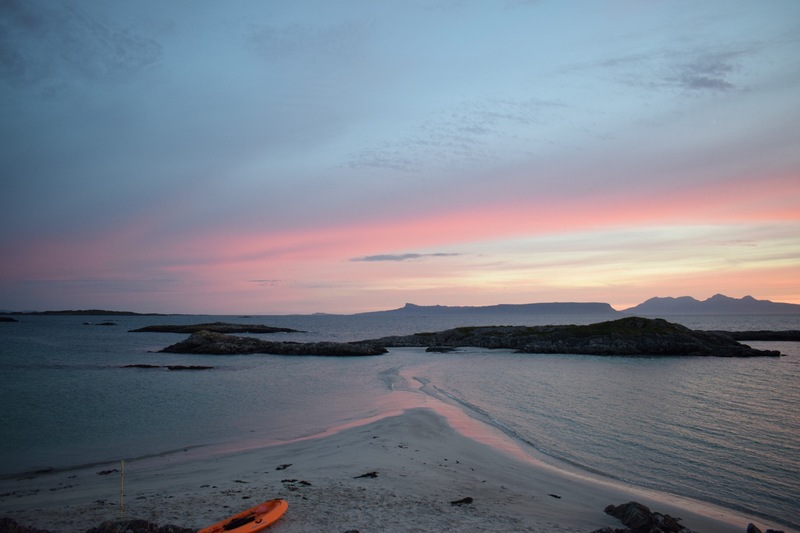 We were desperately looking for some local fresh fish to take with us to cook as we were fairly sure we were going to be on the sea again tonight, but as it was Sunday there was nowhere other than the coop open. I managed to get some Hebridean salmon, but that was it. The Sunday closing also prevented us spending a sizeable amount in Uigg at the Isle Of Skye Brewery shop! If you are passing through, we highly recommend the Skye Red and Skye Gold Ales. 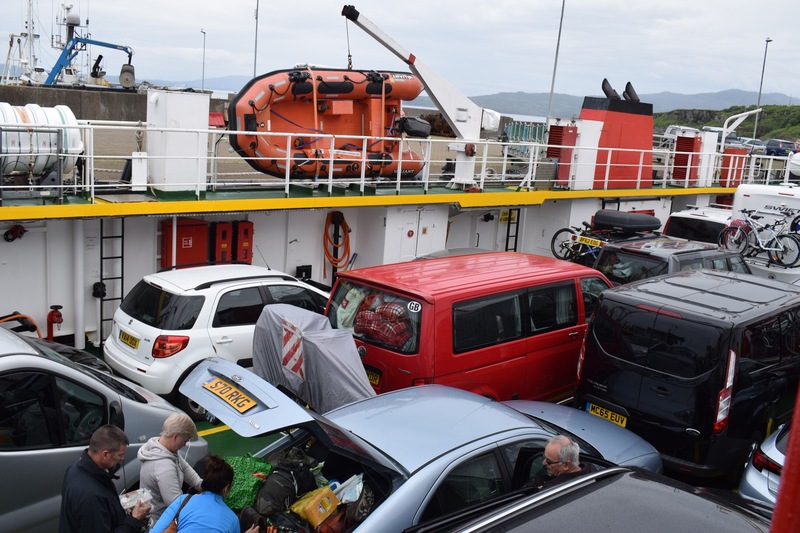 After a quick ploughmans lunch in Ruby whilst queuing for the ferry, we loaded onto the slightly larger ferry, the CalMac Hebrides Ferry. We were so excited, its been a plan to revisit Harris after our last visit in 2012 and the weather was just incredible and looked set for the week. The ferry journey was a lovely and smooth 90 minute journey. 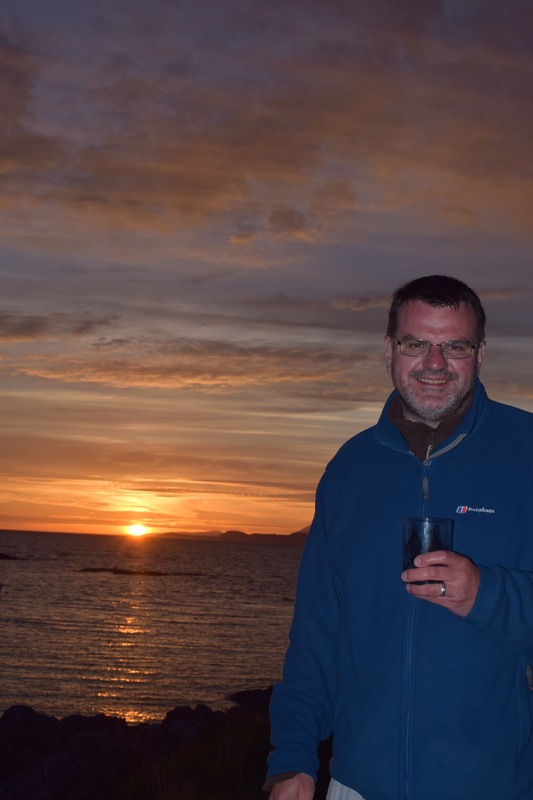 We sat on the top deck looking for whales and dolphins and enjoyed an Isle of Skye red. It got so hot we actually needed to move to the shade! This is a great Campervan recipe as you’ve got the flexibility to change the ingredients to what you can find! Whilst away in Pembrokeshire we found some local Samphire on sale in the fishmongers in Tenby. We’d got a couple of delicious looking Tuna steaks in the fridge already that we had picked up from Aldi, but obviously the preference would be to buy from a local fishmonger. We’ve also tried this many times with salmon fillets which is equally as lovely. And if you can’t find Samphire then using asparagus is just as tasty. Cut two large squares of tin foil and place the Samphire (or asparagus) in the middle. Place the tuna steak or salmon on top, season with salt and pepper and mixed herbs, and add a knob of butter on top of the fish. Pull the sides of the foil up and fold over so the fish and veg is encased in a package. Get a frying pan over medium to high heat (or place straight on a campfire!) and place the foil package on the frying pan/hot coals. Leave to cook ten mins or so. After ten mins gently check to see how the fish is cooking. It will change colour so you can track how quickly it’s cooking. When cooked remove from the pan and leave on the side whilst you add a knob of butter to the already hot frying pan. Any left over Samphire that wouldn’t fit in the parcel can be fried off for a couple of minutes in the hot butter. * could be any county – depends where you brought your fish! I saw this on the menu at a pub we had a drink in and just knew I had to do my own version – the more I thought about the more it dawned on me what a great camping recipe this was! We were in lovely Tenby, Pembrokeshire and so hit google to find a local fishmongers. Sure enough Google guided us to one a couple of minutes walk away. Simply Seafood was the perfect place to purchase some fresh seafood for our chowder. 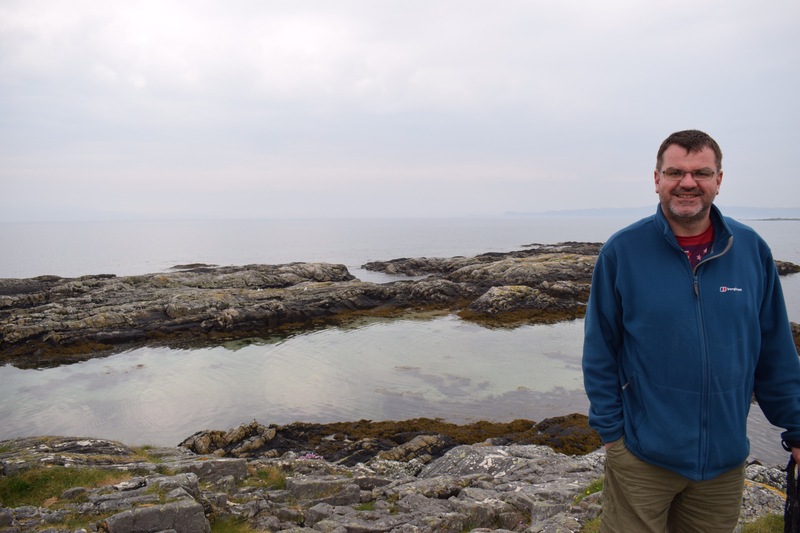 We opted for a simple chowder with just Cod – the lady told me it had been caught early that morning – when I asked where from she pointed to the Harbour and said “turn right”! However the joy of a chowder is really you can put anything in! Prawns, white fish, yellow fish- shellfish- up to you and more importantly, what you can get your hands on. Next evening and I was all set to cook it. For two (with large appetites!!) you need a large (preferably local) baking potato, an onion, some garlic, some fish stock and some milk (or cream). And obviously some wine (or fizz!) to keep you hydrated whilst cooking! Peel your potato and cut into small cubes. The smaller the cube the quicker it cooks. You want it almost over cooked so it mashes up nicely. Slice the onion and garlic and fry until a light brown. We had one largish piece of cod (£3.50 bargain!) for the two of us. Once the potatoes are cooked drain and use a fork to fluff them up a little. Cut the cod into small chunks. Boil kettle and pour about 300 ml water into the saucepan with the cooked potatoes and add the fish stock and the cooked onion and garlic. Leave to simmer for a few minutes before adding the cod. 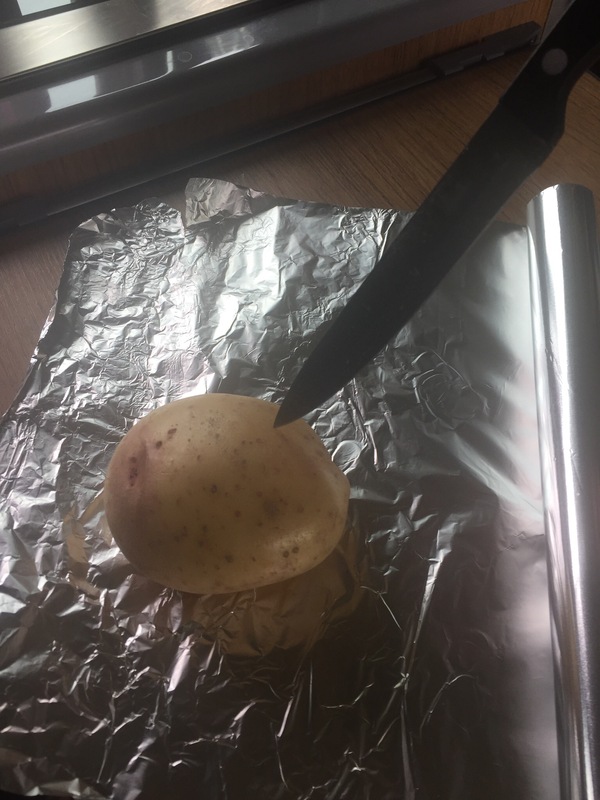 Use a fork to mash the potato along the side of the saucepan. Add a glug of milk (around 100ml) and cream if using. Leave to cook for around 6-7 minutes once you’ve added the cod. Serve with fresh local bread and a glass or two 😜 of white wine. Perfect Campervan meal whilst why the sea – especially when it’s a little chilly,rainy or blowing a hoooley outside! 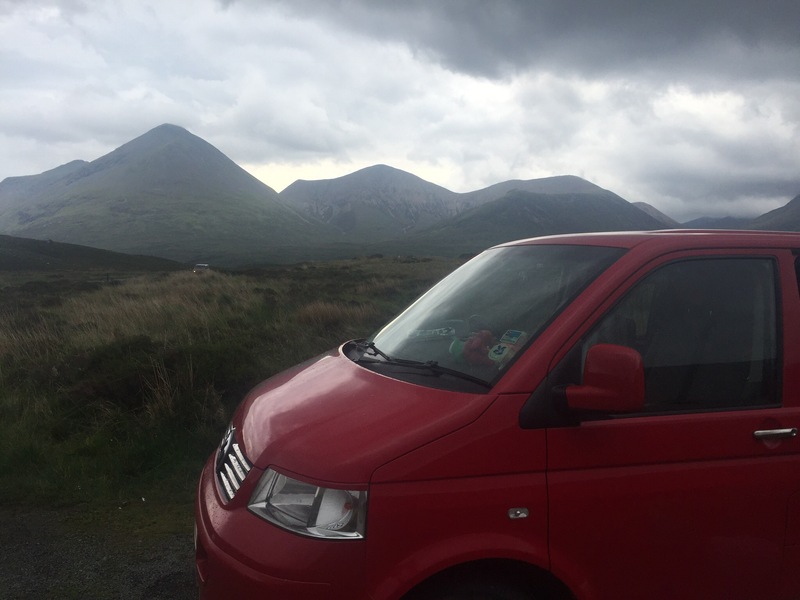 After a wet and wild night outside, we’d thankfully slept well and it was time to pack up Ruby the campervan and carry on along the coast towards Cardigan Bay. We’d booked onto a Coastal site at Nant- y- Croi but we were both feeling pretty fed up from our St Davids washout and having had no internet, radio or TV since Friday we had no idea what the weather was going to do. We were both agreed if the weather looked bad we were heading home! driving to find a lay by with 3/4G! 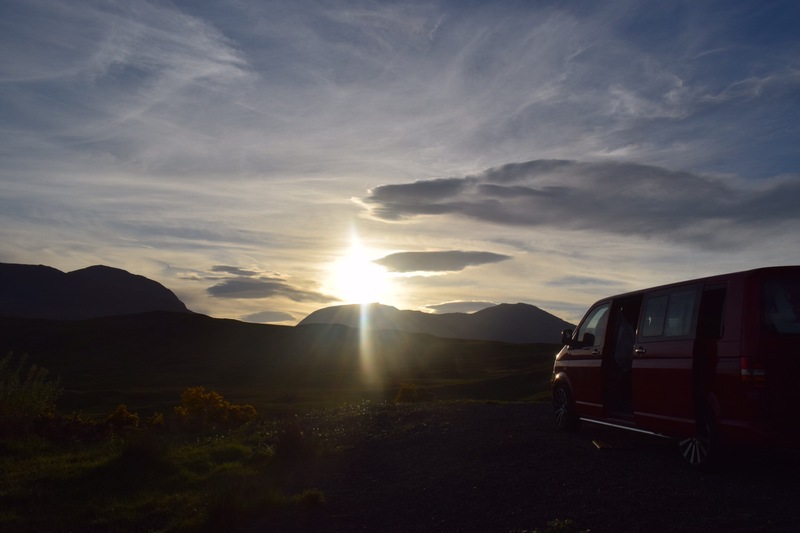 The idea of going away with no phone signal/internet sounds appealing to most I know – but in reality on a trip in a campervan/motorhome it’s really not ideal- we’ve come to rely on the web- always keeping an eye on the weather, banking, local attractions etc- it helps us make the most of our holiday. Plus it’s nice to see the news. We missed the news about Bruce Forsyth dying, our home county seaside resort being on lockdown and also I needed to pre book a boat trip for later in the week! Plus the blog was weeks behind! Anyway it wasn’t long til we found signal and we were able to assess what to do. Weather looked promising so we made the decision to carry on, so we stopped at the Aldi at Cardigan and stocked up, I booked us onto a bit trip for Wednesday before making our way to the campsite. As soon as we pulled in, he sea view took our breath away- it’s by far the best view we’ve had on this trip. The campsite is on a working farm but the camping field Is HUGE and overlooks the sea. Sun was shining- We were so relieved. Then we realised there was free wifi WHICH WORKED, so despite being no phone signal we can reconnect to the world again! We spent the afternoon catching up on emails and looking out for dolphins. I nearly cried when I actually saw some! 😊 Keith reminded me to get my telescope out to help me dolphin watch 🐬 and we had a marvellous afternoon chilling in the sun. Dinner was cooked and eaten al Fresco- a yummy simply cook Thai red prawn curry. What a difference twenty four hours makes. Tuesday arrived and the sun was still shining! Happy faces in the O’Gorman camp let me tell you! Today we are having a big chill. We set up the telescope and commenced operation relax – breakfast butties were served at 11:00, and at 1pm we went for a little wander to see the local beach (National Trust Mwnt, very pretty but not dog friendly between May- Sept) so we headed back to camp and carried on chilling whilst publishing all the missed blog posts. Around 5pm we wandered down through the campsite’s permissive path to the coastal path and I took donny drone for a play. I really wanted to send him backwards out to sea a bit but got scared so kept him over land. After that we got the Cadac gas stove out and cooked a steak fajita feast for tea. Yum. 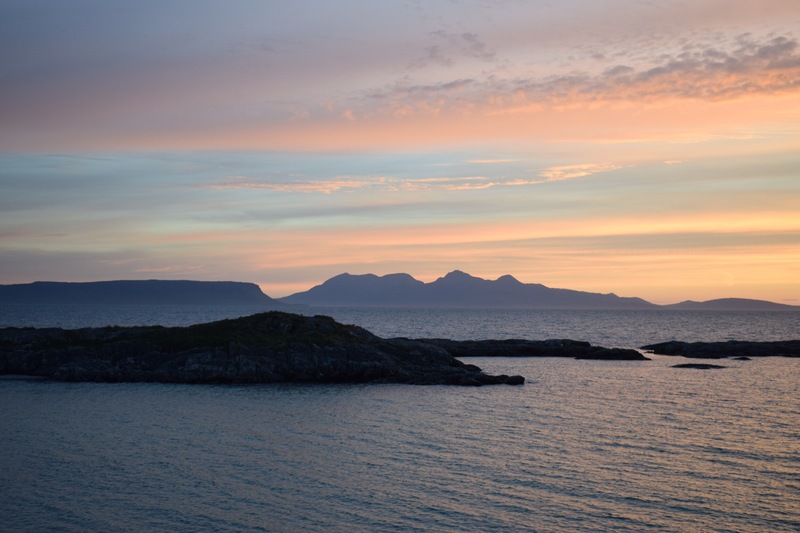 The views from this site are just breathtaking- I think we are really going to miss them! The only thing I would say is that whilst the farmer obviously is very eager for everyone to be happy here which is very nice to see, and of course we appreciate, he’s coming round to speak to everyone on his quad bike several times a day! Lol. I love a natter but think he’s perhaps taking his desire to please his guests perhaps one step too far! But maybe that’s just us being anti social! Tomorrow we bid a sad farewell to our Cardigan Bay seaview and are heading up the coast a bit. We are also going on a dolphin watching boat trip! Woo. We were up and away from Knights Folly Campsite by mid morning. We were sad to be leaving the site as it was lovely- however it&apos;s always exciting to be moving on elsewhere to see new places. Our journey took us down the M4 and over the Severn Bridge, at which point we entered Wales and all the road signs were larger with both Welsh and English written on! We were heading to Burry Port, but stopped at Llanelli for an Aldi shop. In Ruby we&apos;ve been only shopping 4 days at a time but Keefy talked me into trying a 7 day shop this time. I was worried about fitting it all in, but I had to eat my hat-everything found a home – the cupboards are filled to busting, the fridge stocked to capacity, the cool box full of alcohol and sparkling water BUT we did it- 7 days shopping in Ruby and we can still fit ourselves in! She really is a tardis! We arrived at Burry Port Harbour, listed in the Britstop book but also many places elsewhere online & paid the Harbour master £8 for our overnight stay. We were encouraged to park side on against the sea- so our sliding door came into its own! There were a couple of other vans with us- and we managed to have a little wander around the pretty harbour before the rain set in for the afternoon and evening. And wow did it set in- it absolutely LASHED down! So we settled in and watched some Cracker- before I made us a delicious Simply Cook Beef Rendang. 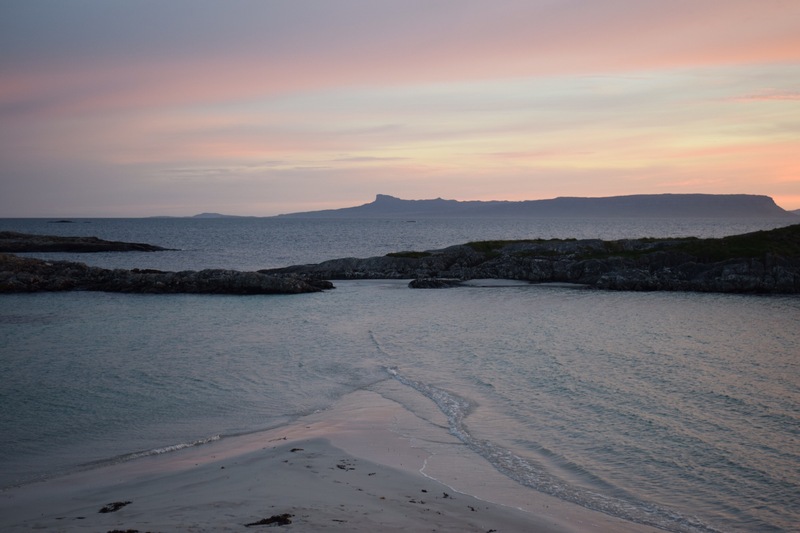 Just as I&apos;d finished washing up- the sky&apos;s cleared so we were able to have another wander, this time in the Fading light, before sitting and enjoying a dram before bed with the door open listening to the waves crashing below. The forecast for Tuesday was great, and it did not disappoint. It&apos;s always exciting opening the curtains to a new location, when the day before the visibility was next to nothing. The beach here at Burry Port is fabulous! I wasted no time and almost jumped out of bed- even forgoing my morning cuppa! I&apos;d been itching to launch my DJi Phantom 3 drone and weather conditions just hadn&apos;t been on my side- but now they were! Woo! After breakfast baps and a cuppa, we took Jazz for a run off lead on the beach. He doesn&apos;t normally go off lead as he can forget to come back if he picks up a scent. But on beaches that are secure we let him off and he loves it. Actually his recall was amazing today! We had a paddle and the water was lukewarm. I wish I&apos;d got my cozzie on as I could&apos;ve had a dip but it was time to get moving- we were off into Pembrokeshire. 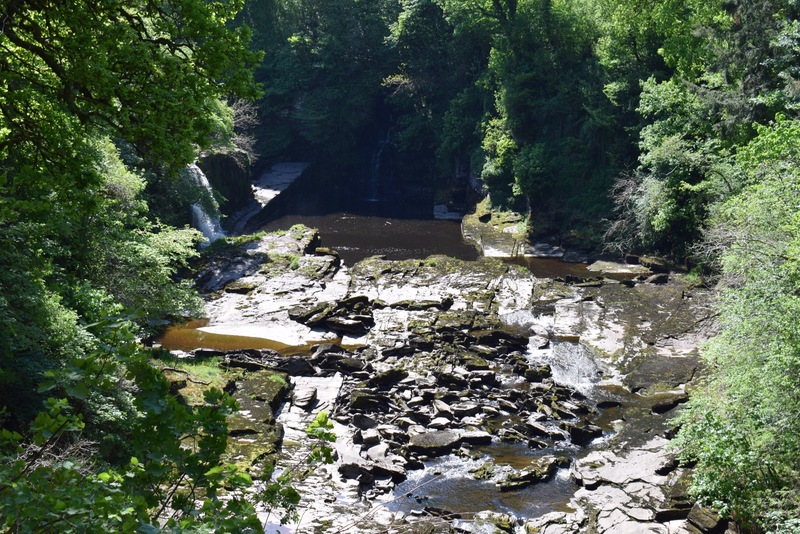 Next time we come here there are loads of cycle paths to ride on, including a country park with a 4 mile Tarmac circuit, an old train line at Llanelli and a coastal bike path running through Burry Port. We paid for an hours parking but we could have spent all day here really. It&apos;s gorgeous. Loads of families were crabbing over the Harbour wall. The beach was PACKED (but not dog friendly between May and Oct). There were old fashioned amusements, little beach shops, an old fashioned off license (where we stocked up on local Ale and cider), a local ice cream seller- we loved our Pembrokeshire Promise icecream (honeycomb and vanilla-yum). We even managed to squeeze in a quick pint in a really cool pub called The Old Chemist which had a really great smugglers alley entrance and beach and sea views. Next stop was our campsite, Middle Hill Farm, just the other side of Tenby, on the outskirts of Manorbier. We were a bit disappointed at first- we booked at the beginning of March and was told we could have a sea view pitch. We were given pitch 4 which basically had a view of a hedge – right next to the main road-we could have been anywhere in the country! 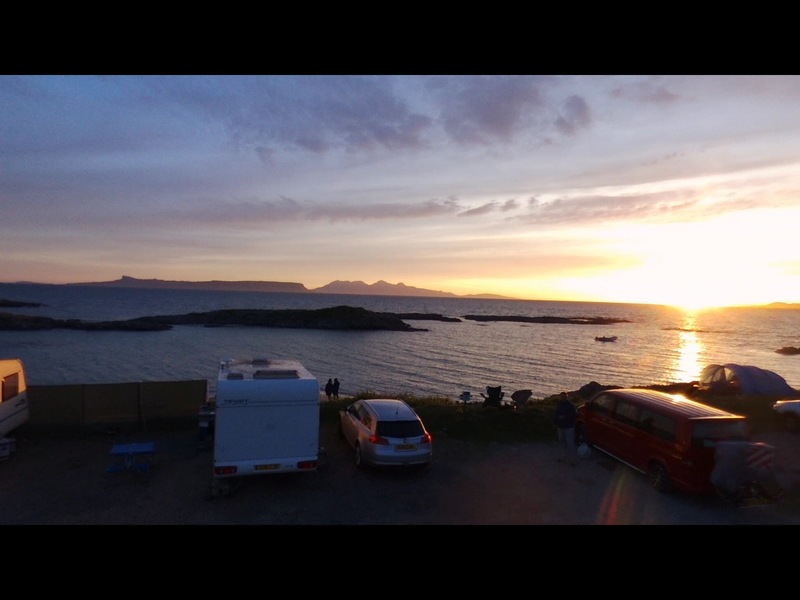 Two caravans had the best views, so we were a bit fed up. Plus one of them had a reserved for sign on. The facilities were quite a walk down hill through a field. Keith was grumpy and so was I. Yes, it&apos;s only £15 pn but we are here for 3 nights and paid on 3rd March up front! He went off for his shower and returned 5 mins later- he&apos;d spotted a pitch at the bottom of the field next to the facilities and with a sea view, and went to ask if we could move. The answer was yes! Hurrah! So we threw the chairs, windbreaks etc in the back and drove to our new pitch, no. 8, and set up again! And enjoyed our Welsh Ale/cider enjoying the view. The weather was gorgeous so we sparked up the BBQ for dinner- enjoying a homemade potato salad, garlic mushrooms and venison burger, lamb and mint burger and chilli sausage. We stayed outside until 10pm watching the day change to night. Perfect. Wow was it blustery in the night! The winds were up to 40mph and we&apos;ve never heard rain lash down like it did! It was so loud that Jazz had a panic attack and therefore ended up squashed on our bed rather than up front in the passenger seat! The weather was still rather blustery as we got up, and it was overcast with the promise of more rain from 4pm, so we had a steady morning before walking the short distance down the field path the farmer had put in, to the village of Manorbier. Manorbier has a really lovely castle you can explore with the best preserved corners of tower we&apos;ve seen. Inside there is a tea shop and you can enjoy it on the lawn. It&apos;s a nice place to spend an hour but there wasn&apos;t an awful lot of info about the castle and it&apos;s history therefore we found the £5.50 entry charge a little steep. We carried on up the small road past the sandy beach, where despite it being very dull, lots of people were out enjoying themselves on the beach- good old British eh?! We carried onto a house aptly named as Atlantic View before taking a path off to the left which took us onto to Pembrokeshire Coastal Path for our return back to Manorbier beach. It&apos;s a dramatic section of Coastal Path and although Keith found the contours a little tough, we both really enjoyed the wild scenery matched with the driving wind. We passed a couple of pretty hidden sandy coves but chose to have our picnic overlooking Manorbier Beach before washing it down with a little pint in thelocal, The Castle Inn. Prices down here in pubs are very reasonably priced- we&apos;ve not paid more than £7 for two alcoholic drinks yet since being in Wales. The rest of the afternoon was spent chilling and watching Cracker as the weather turned just as we arrived back at Ruby- talk about good timing! We enjoyed a chilli con carne for dinner before having an early night. 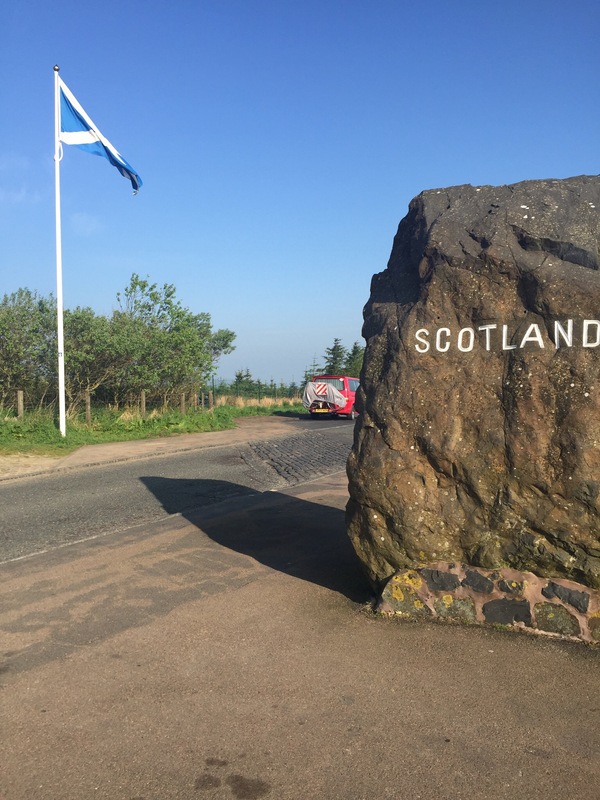 Ruby the campervan is parked up at our favourite Scotland Border crossing, Carter Bar, just before Jedburgh. It’s 00:30 (Friday morning) and we were working until 7pm in Thetford. It’s been a funny ol week, we’ve battled illness, workload and a new (unplanned!) motor for Ruby’s habitation sliding door, but somehow we’ve made it here and in record time! If that doesn’t warrant a beer I don’t know what does. Unlike previous stays here, tonight we have company in the form of two other motorhome. Trying to be as quiet as we could, we set Ruby up for bed and crashed out for a hefty deep sleep. Friday dawns the most spectacular of day’s. We were up by 07:15 and enjoyed actually seeing the view! Usually it’s misty! Not only is it ☀️- it’s also HOT!!! At 07:30 I’m parading around in shorts and a vest top- with NO FLEECE! 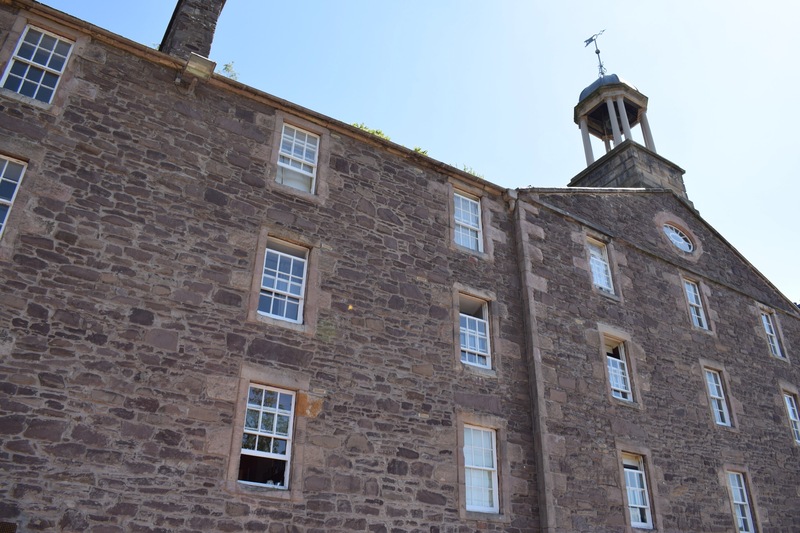 We had a quick chat with our neighbours before hitting the road again just after 08:00- destination, Loch Lomond, via New Lanark, a UNESCO heritage site near to Glasgow. 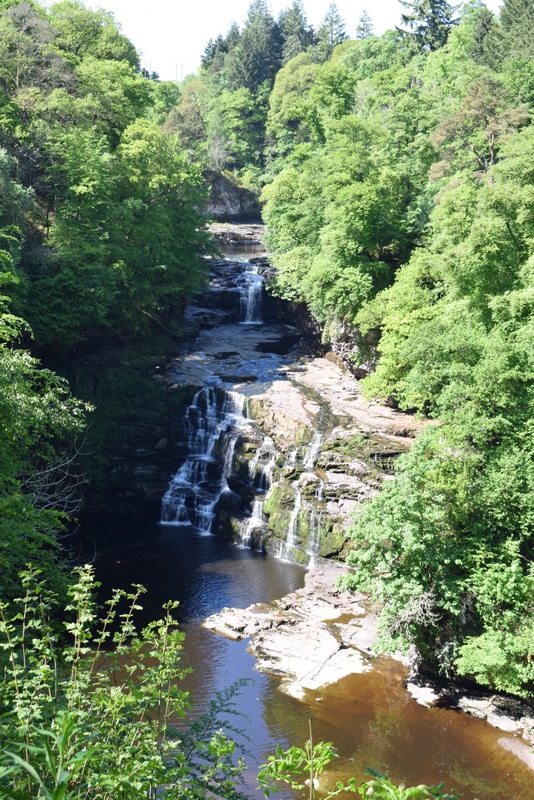 We followed the Tweed Valley all the way and it was so beautiful, all these years of coming, it’s always a great treat to discover a new gem and has earnt a place on our “next time” list. 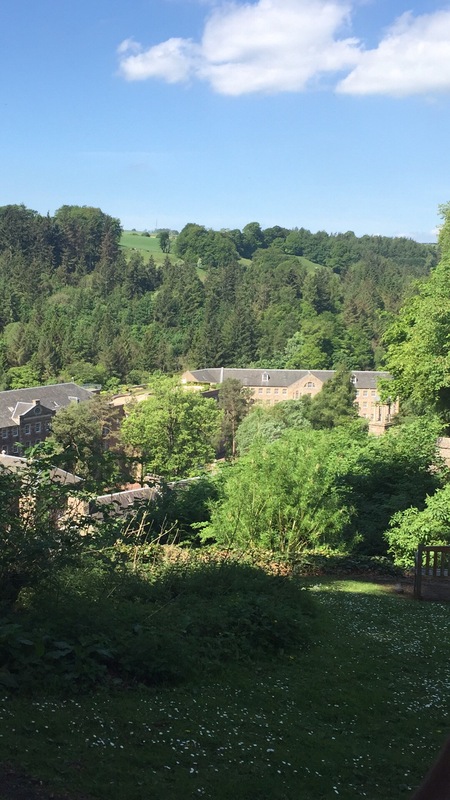 New Lanark was lovely. It’s now looked after by UNESCO but once was a Georgian Mill village. All the buildings have been kept original, and you can go inside many for a fee. We chose not to as it was such a sunny day it seemed a shame to be inside. 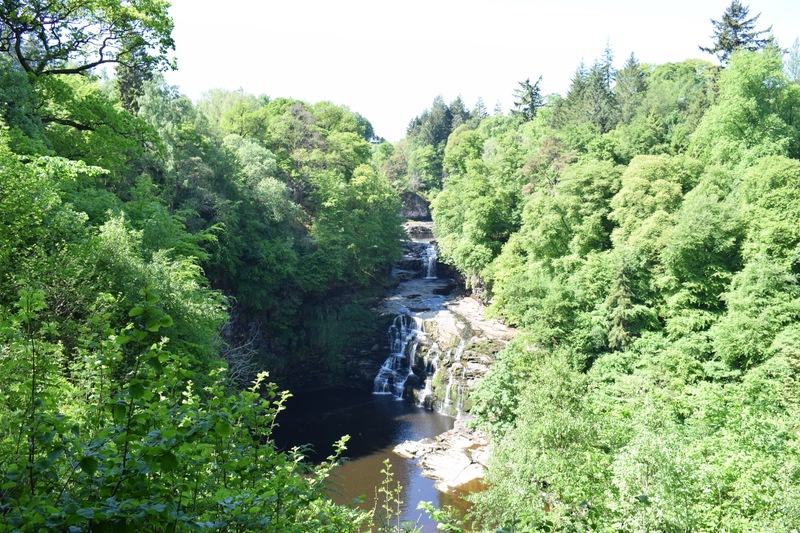 Instead we took advantage of the 5km woodland and waterfall trail along the banks of the River Clyde. Parking was free which was a nice touch and there is no entrance fee if you are only wandering the village without going inside. Parts of the walk along the Clyde reminded us of being in Colorado. 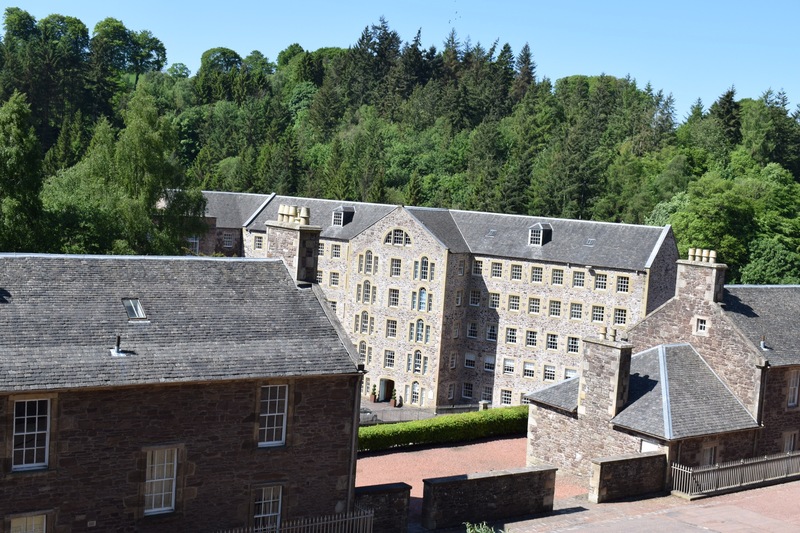 After our walk, we enjoyed some of the New Lanark ice cream which is made on site. After a quick lunch we hit the road again passing through Glasgow and onto Loch Lomond. Always an exciting moment for us getting that first view of Ben Lomond. We stopped at the farm shop near to Luss, stocked up with local cider, cheese, venison- all the essentials! before carrying on to the main car park in Tarbet. 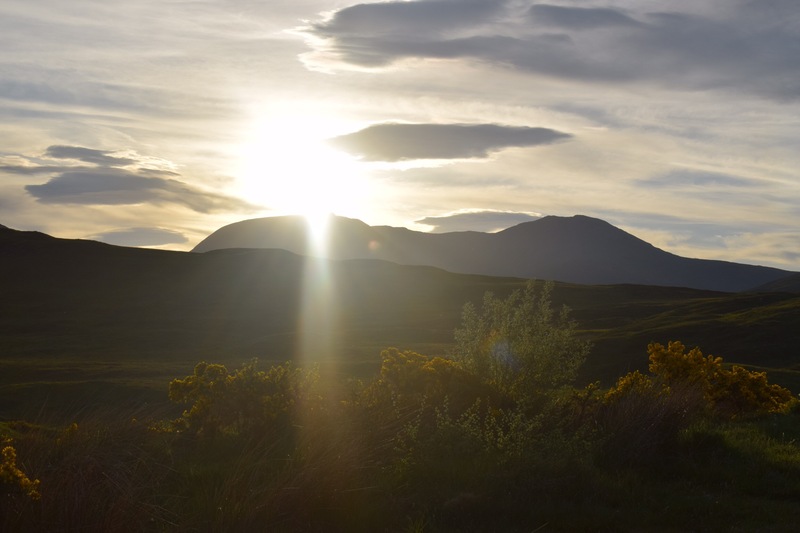 Recently wild camping in Loch Lomond and The Trossachs has been banned, however they have introduced a fair system of pre purchasing a permit for the evening at £3 per night. We were keen to support it and duly paid our £3 online 30 days in advance, choosing where we wanted our permit to be valid. Sadly, on arrival at 5pm the car park was packed. We managed to squeeze in a space but the area was heaving. 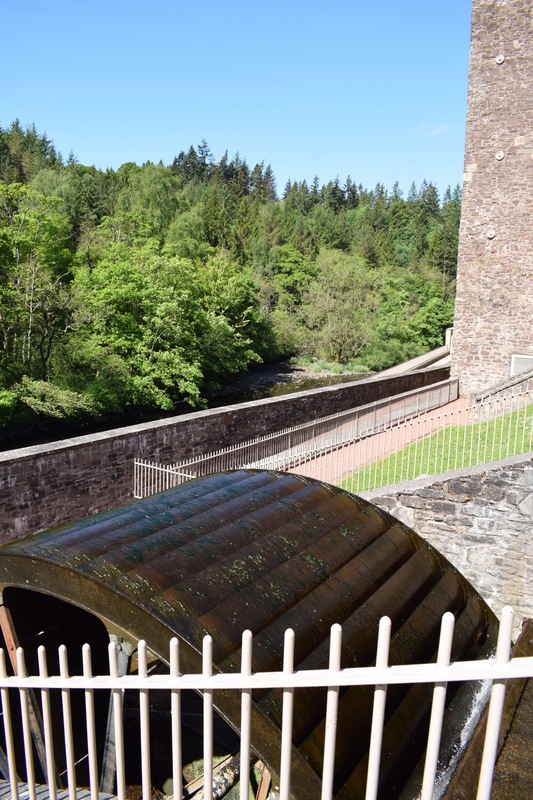 Obviously the sunshine and the bank holiday was bringing the world and his wife out, and although we gave it a good hour, we decided it was far too busy for us, and so we set off again, this time heading for the viewpoint at Black Mountains, just beyond the Bridge of Orchy. It was a gamble, would we turn up and find no space, as it was going to be near to 7pm. It was a tense journey, but luckily we arrived to find bags of room, with only one other van there. 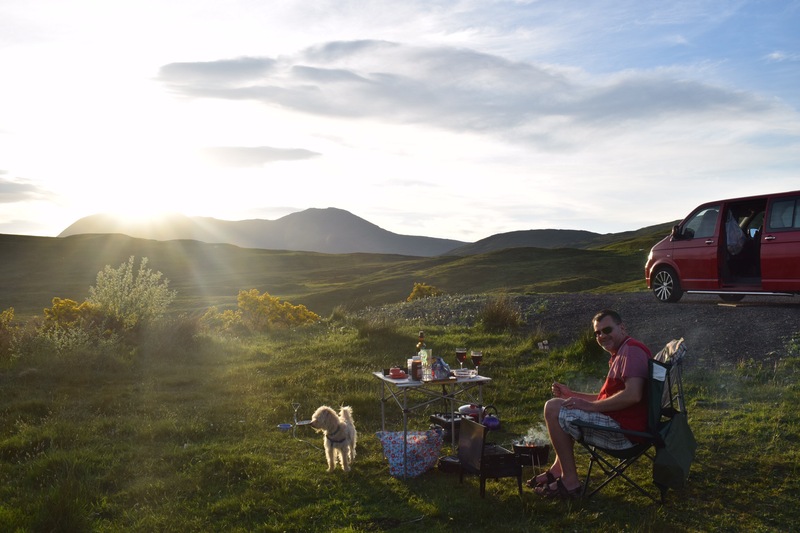 We bagged the best spot too, so we went about setting up a BBQ and went on to enjoy a fabulous evening. During the evening several other vans arrived, including a caravan, all stopping for some rest before heading north again early the next morning. We had a wonderful evening and slept like logs! Saturday arrived and the sunshine was still here. Hurray! The forecast however was not so optimistic, so we set off, stopping for breakfast at Glencoe, always a favourite- good lord, it was SO BUSY! We’ve stopped there every year for breakfast and this year without a doubt was the busiest we have seen. 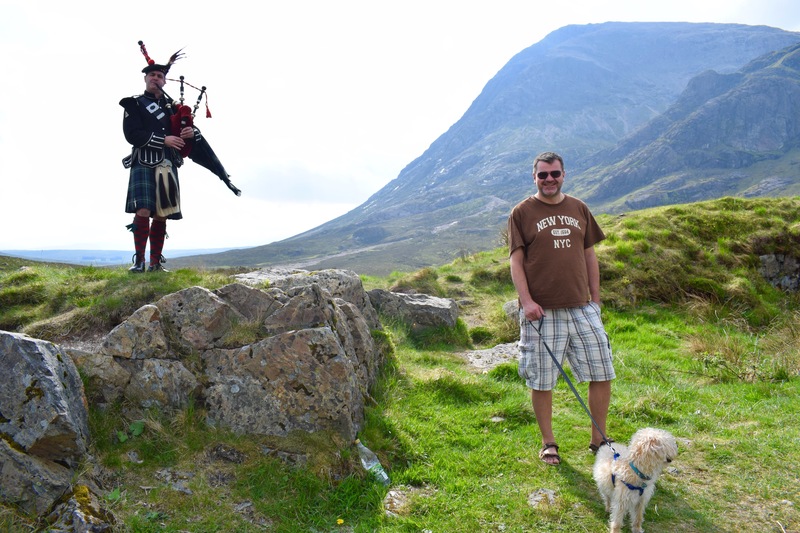 We squeezed on to the end and managed to have our breakfast, I decided to make the bagpiper a cuppa which he enjoyed. Good deed done so off we travelled again, towards Fort William. Again, it was PACKED! We squeezed into Morrisons for a top up shop, there were queues everywhere, not too dissimilar to the Christmas Eve shopping experience! 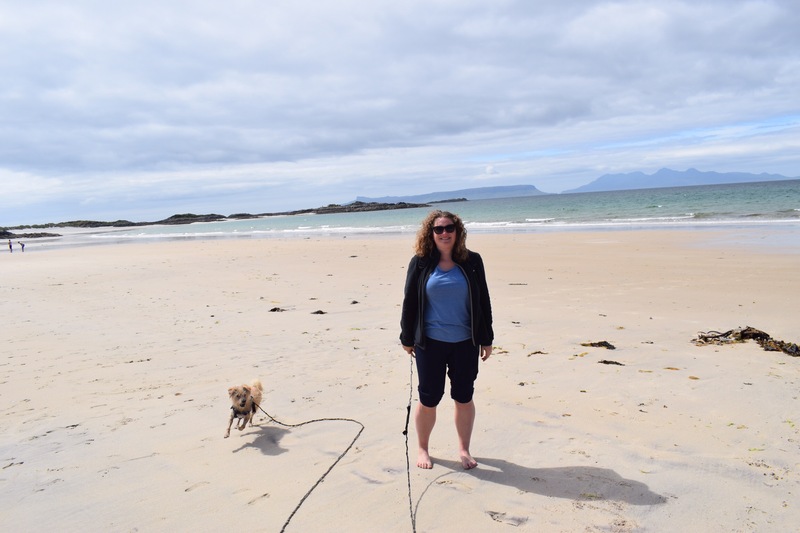 I managed to get some local gin, which cheered me up, so shopping loaded in, we set off along the road to the Isles, our destination being one of our favourite sites, SilverSands at Arisaig. We tried to stop at Glenfinnan Viaduct, but couldn’t get parked. Are you noticing a theme here? Onwards we went, arriving at Silversands just as the rain began. A spot of rain does not take away the beauty of this place, and once again we were lucky to have a sea front pitch so we settled in, had a long nap and woke in time for the rain to have gone. 10 steps away from our pitch we had the most gorgeous white sand beach. It really is idylic. 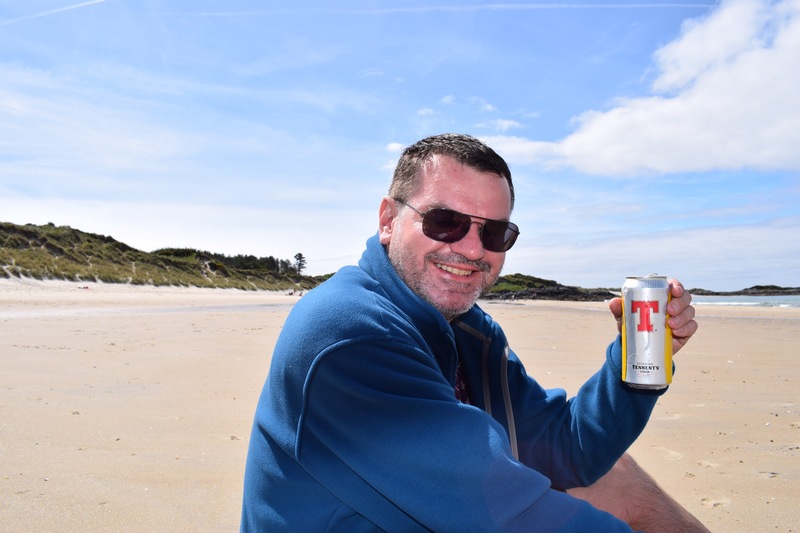 We enjoyed a beer on the beach, and met our neighbour, Charlie, who turned out to be a lovely fella- always checking if we needed anything from the shop when he went in his car. That evening I cooked us a delicious Simply cook prawn linguine and we went to bed around 11- it was still light! Sunday- the weather forecast wasn’t good, which was disappointing so we decided to have a lazy morning. I cooked us a cooked breakfast and just as I was serving up, the sun came out! “Quick”, I said to Keith, “get the outside chairs out, it may not last”! We enjoyed our sea view and watched as people fled to the beach, kayaks and dingies in hand, everyone desperate to enjoy the sun whilst it was there! Last night we discovered that the midges are here! Booo! Apparently it’s the long mild winter, but they are here, and in force. Keefy has been eaten alive! And guess what, we’ve left all our sprays at home! During a morning chat to our neighbour, he got brave and asked if they had any repellent he could borrow. Cue Charlie giving us an entire full spray of Smidge, insisting we keep it. What a nice man! Ruby is getting a lot of attention. Keith gets stopped several times as he is getting the bikes off! All these years of motorhoming and barely anyone ever speaks to us, yet now we have Ruby we seem to be attracting people for chat after chat! Not that we are complaining, it’s nice to be sociable, and everyone here is just SO FRIENDLY! We finally manage to get off, we are cycling 2 miles down the road to Camusdarach Beach- where the film Local Hero was filmed 35 years ago. We came a few years ago but the weather was dull and murky then. 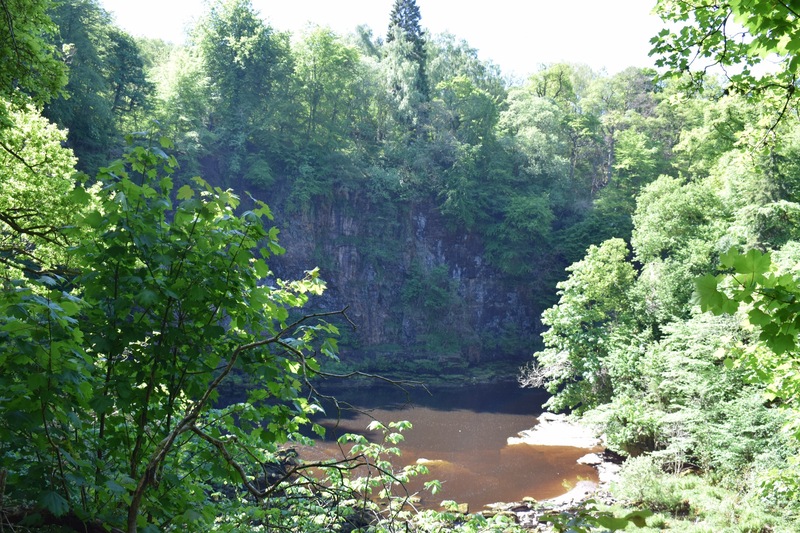 Today, the sun is hanging on in there, so we optimistically pack a picnic and keep everything crossed! 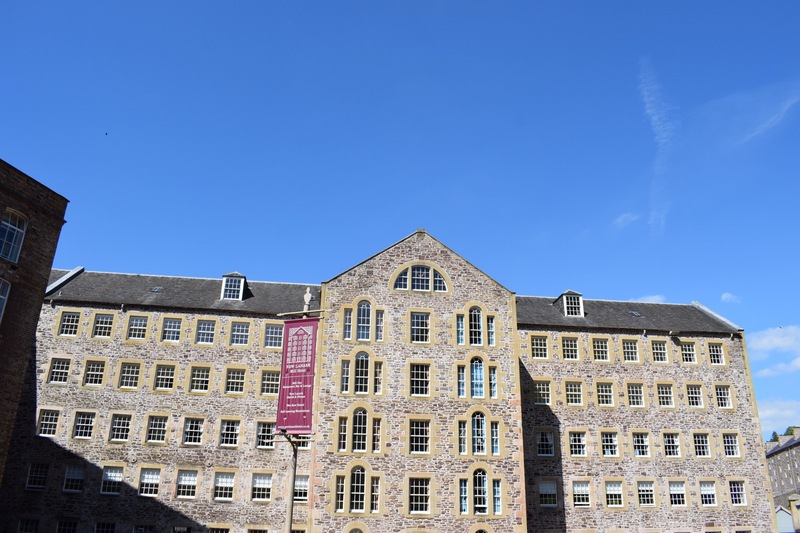 The weather gods are certainly on our side it seems, it’s a picture perfect day. This beach is simply stunning. It stretches for probably nearly a mile when the tide is out, as it was when we visited today. When the tide is in, there are 2 beaches not reachable without getting wet! I tried to send my drone up but it wasn’t happening, a badly timed update request means I can’t send it up which is annoying but can’t be helped. 😡 We had a lovely picnic though of cheese, venison slices, fresh baguette, and of course a beer and cider to wash it down. We had such a lovely visit! The sun was still shining on our cycle back, and it continued to shine the remainder of the day and evening. We sat outside taking in the ever changing view from our pitch- we watched as the tide came in and then went out again. We had a lovely chat with next door, and shared a drink together. As the evening went on we were joined by several other couples seeking out the best views of the site. Seems we were on the best pitch going- we were happy to share it. 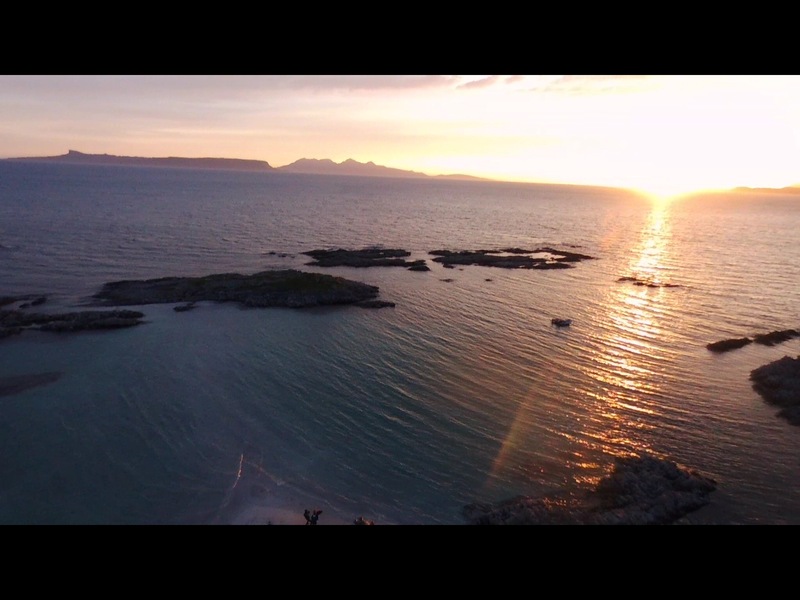 I also managed to override my drone so I sent that up to capture the phenomenal sunset. Next door also had a drone, a DJ phantom, so he sent his up too! The atmosphere on site was electric. Everyone having a drink, toasting the sun, it was just such a happy atmosphere. There were even people doing yoga on the beach! It’s a really really special place! Obviously the local gin helped of which I managed to make quite an indent and Keefy’s whiskey must have evaporated in the heat 😜 but we soon realised it’s was gone 9pm and we still hadn’t eaten! Whoops! Dinner was quickly cooked and eaten and we enjoyed the last of the sunshine. The whole campsite came out to see it dip below the horizon, I almost felt like applauding! Off to bed we went, tipsy but on a massive high to say the least! The next thing I know, and it’s 3am and K is raiding the fridge, rubbing the contents of the the fridge on his legs! Turns out he is in agony with his bites. 😞 An advantage of having Ruby is that he can’t pace any more, however tossing and turning in bed and grumbling is as bad for me to hear. At 4am I suggest we go down to the beach and he goes for a paddle! The seawater helped soothe his legs earlier and I know he must be in agony cos he agreed quickly, so at 4am we were on the beach having a paddle, like you do! The seawater must have helped as of course, he managed to get straight off to sleep, whereas I lay away awake for 2 hours! 🙄🙄🙄🙄🙄🙄 mind you hearing the sea lap beneath you and the dawn chorus is not the worst way I’ve spent a couple of hours. Monday arrived and as forecasted, the rain decided to make an appearance. Next door, bless them, gave Keith some antihistamines to help his itching, and also a couple of cans of Tennants for our fridge as a parting gift- how nice was that? We had another couple of people stop by Ruby interested in her conversion, and admiring her, it’s really a very strange sensation for us as unlike many others it seems, we were not drawn to VWs cos of their image! It was just the van which worked for us! Hey ho, it’s really nice to have chats with lots of different people and something that has never happened to us before in 7 years of motorhoming! We waved a sad farewell by 10:15, and rolled into. Mallaig for our ferry to Skye just before 11. “Are you booked on?” the man cheerfully asks. “Er no….”. “Sorry but we are fully booked ALL WEEK!” You could see the colour drain from our faces. What an epic oversight. We’ve done this crossing three times before and never booked. What’s going on?! The man offers for us to queue in the reserve queue for the next ferry at 12:00 although he says there is no guarantee that we will get on. We decided to go for it. Luckily, Lady Luck was on our side and they fit us on, what a relief, neither of us fancied the journey back to Fort William retracing our steps! 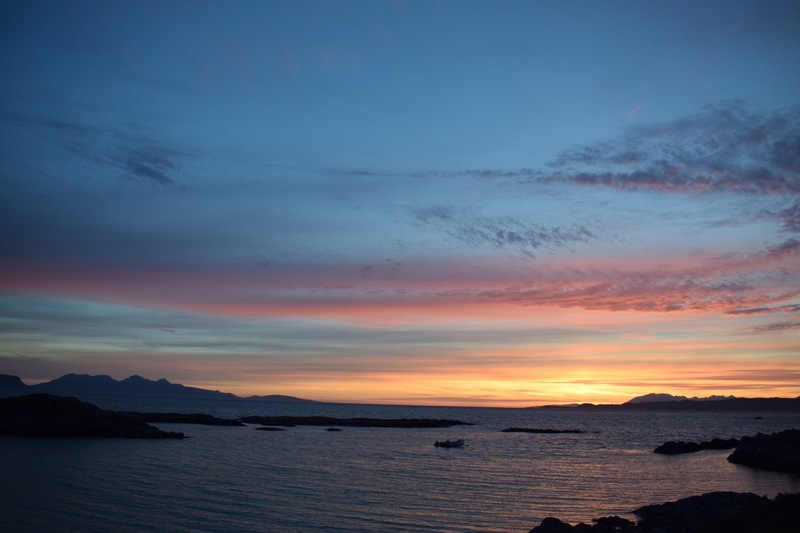 We arrived on Skye thanks to a smooth crossing (unlike last time!) and it’s been raining all afternoon. Can’t complain though, we’ve had our share of good weather for Scotland. 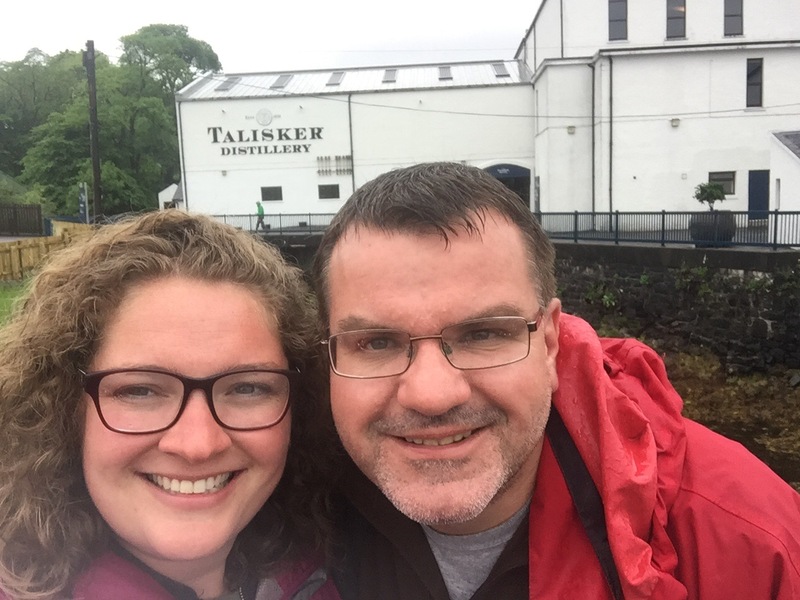 We drove to Tallisker, hoping to park somewhere local so we can have a few drinks and a meal in the pub opposite the distillery. Like everywhere else, Tallisker is heaving with people and we struggle to park. 😔 in the end we manage to get a space but we are unable to stay overnight. So we opted for an early dinner in the pub, which was delicious before driving on to a large lay-by on the way towards Sligachan where we settle in for a chill. 7 years of motorhoming, 5 of those in a vehicle with a Gas Oven, and for some reason I’ve never cooked Jacket potatoes on the road! Then we downsized to a campervan with no oven and all I could think about was cooking Jacket Spuds with our first BBQ! Luckily Pinterest came to my rescue and provided me with an exciting option to try on our next trip using our dinky Slow Cooker. 1. 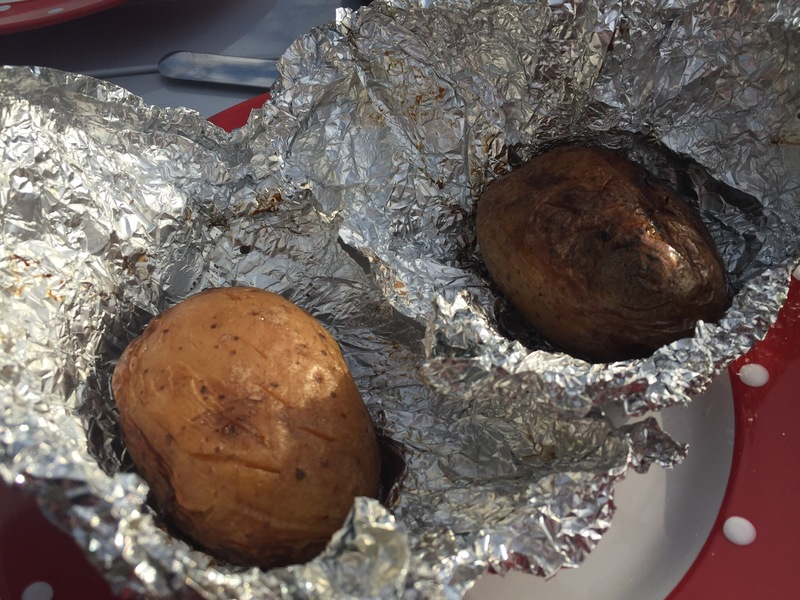 Prick the Jacket potatoes several times and rub in salt, pepper and olive oil before wrapping tightly in tin foil. 2. 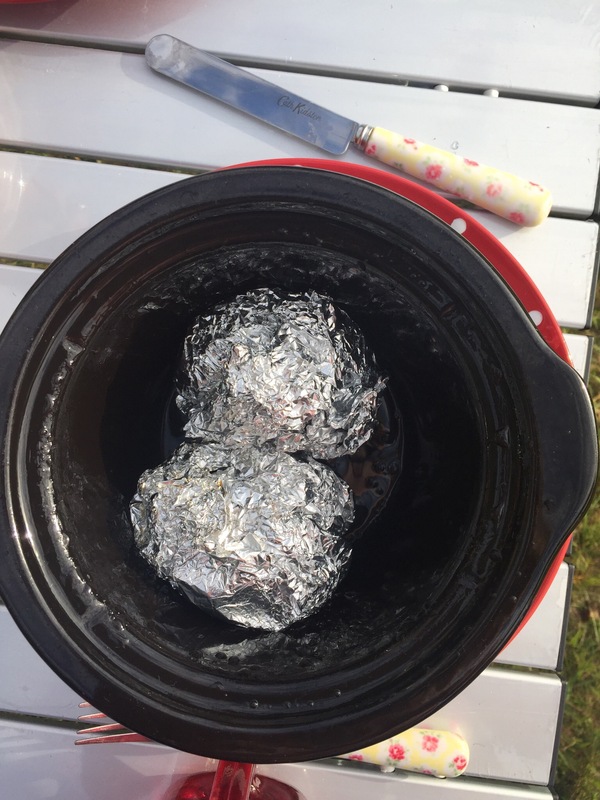 Put your tightly wrapped potato parcels in the bottom of your slow cooker, switch on and leave for either 3.5-4 hours on high, or 8-10 hours on Low. Avoid leaving on the warm setting near the end. We cooked ours for 4 hours on high, but we were not ready to eat so then turned to low for an hour or so. Be prepared for the nicest smells ever in your van whilst they cook. Yum. 3. At the end of the cooking time, unwrap and you can pop them on your BBQ or campfire for five mins or so if you like. They don’t need it, but we did it anyway! When you unwrap you will be surprised how crispy the skins are! Don’t panic if the skins are black, they are not burnt and it is normal when cooked in slow cooker. Split open and put a good dollop of butter inside, and whatever filling you enjoy! 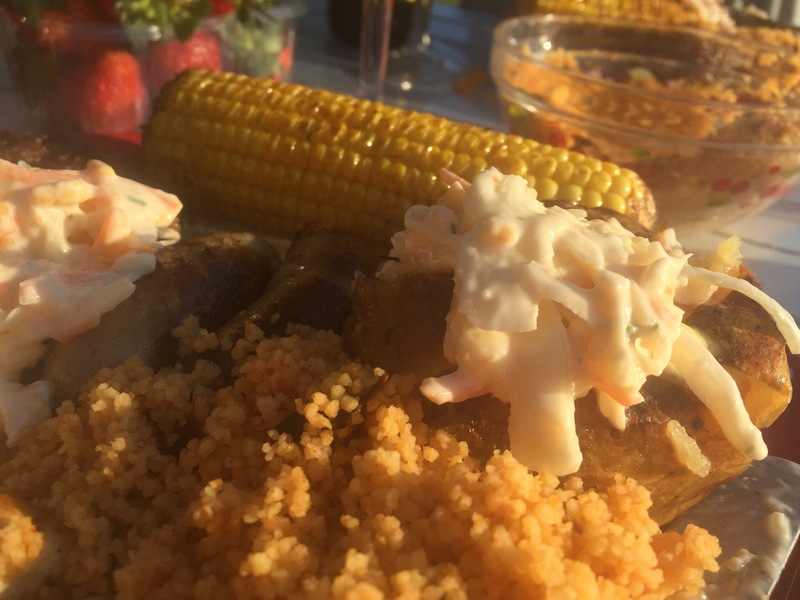 We had ours as a perfect BBQ accompaniment with couscous, coleslaw and corn on the cob. Perfect.